Note : 1, Answer any FIVE full questions. 1 a. With a neat diagram explain the constructional feature of CRT and also explain the focusing scheme used in it. b. Derive an equation for diffusion capacitance of P-N junction diode. c. Distinguish between ideal and practical diodes. Draw piece-wire linear characteristic and explain. 2 a. Draw the circuit diagram of a Bridge rectifier with capacitor filter and also derive the expression for ripple factor and rectifier efficiency. b. Explain the working of a double ended clipper using ideal diodes. Give its transfer characteristics. 3 a. Discuss the causes for bias instability in a transistor. b. Derive an equation for the stability factor S for a C.E. self bias circuit. c. Discuss different types of bias compensation technique used in the transistor circuits. 4 a. Using approximate h-parameter model for the transistor, obtain expressions for Z„ Zo, Av> Ai for a C.E self bias amplifier with un bypassed Re. 5 a. Write the hybrid-Tt model of BJT and briefly explain the various parameters of the model. b. Draw the circuit of a bootstrapped emitter follower and explain how it gives higher input impedance than emitter follower. c. The cutoff frequencies of a transistor amplifier are fi – 500 Hz and f2 = 400 kHz. The midband voltage gain is 80. Find the voltage gain at 250 Hz. b. 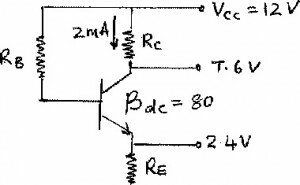 Explain with relevant sketches how power amplifiers are classified. Derive the expression for the conversion efficiency of a class B push pull amplifier. 7 a. With the circuit diagram explain the working principle of a shunt and series voltage regulator. Also obtain the expression for the regulated output voltage. b. What is switching regulator? Explain step-down type of switching regulator with a neat block diagram. d. Class A power amplifier.